One of the world’s best ever known country singers the sensational Dolly Parton is known the world over for her outsized talent, hair and bosoms. It is difficult to find a country singer who has moved from country roots to International fame as successfully. Dolly is a truly gifted songwriter who developed a knack for song’s that told stories. With 26 No 1 hit singles, 42 top ten albums and sold over 100 million records worldwide she remains one of the most successful female artists in the world today. 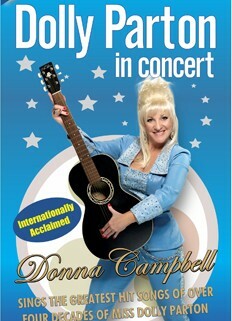 Internationally Renowned Donna Campbell is one hot ticket and one of Australia’s finest vocal performers having performed with Australian and International artists such as Jimmy Barnes, Leo Sayer, Dionne Wawick and Marty Rhone and many more - she sings the greatest hit songs of over four decades of Miss Dolly Parton. Come and relive all of Dolly’s magical No 1 hit singles in a 2 hour live concert experience you will never forget such as 9 to 5, Here You Come Again, Coat Of Many Colours, Baby I’m Burning, Two Doors Down, I Will Always Love You, Joelene, Islands In The Stream and also the songs of today. So put on your cowboy boots and hat and come and enjoy a great night of entertainment as Donna Campbell brings to the stage the magic of Dolly Parton! With every song a hit this show is a must for all music fans.